Two-at-a-time, toe-up Monkeys (with purls) in Fleece Artist’s Merino 2/6 Sock. 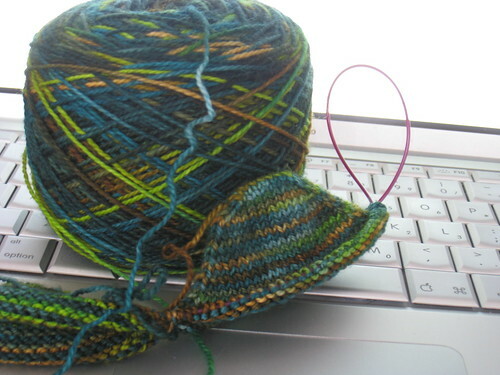 It’s the Forest Dreamscape colorway (made famous by the Yarn Harlot as step-outs for her Knitty Gritty appearance). And so it begins. Previous Post In which I take extreme measures. I started mine today, too. :-) The SOS 08 pattern in Gypsyknits “Happy Tap”. It’s the first toe up sock I’ve done in years! man, that’s some yummy sock yarn. Alas, I have no sock yarn in the desert. But I will start mine when I get back tomorrow!